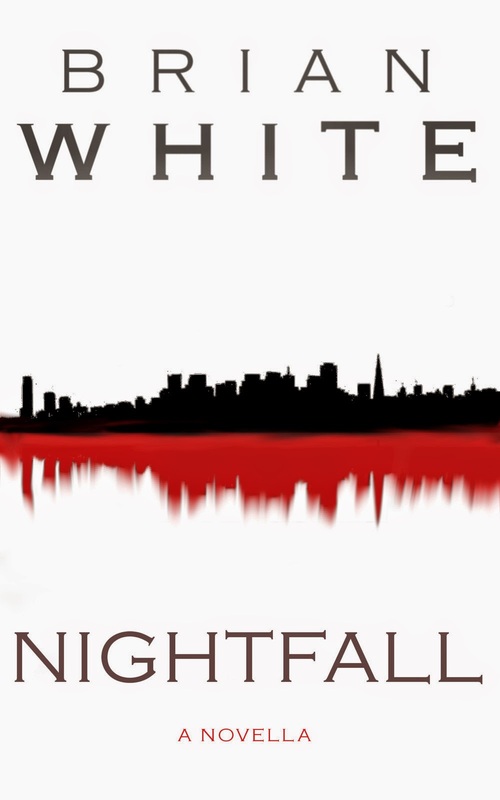 Today we are interviewing Brian White about his mystery/suspense novella, "NIGHTFALL." A focus group revealed that babies have the widest range of opinions. During a reading their reactions ranged from giggling with outright joy at a particular passage, to going so far as to soil themselves during another. Fans of mystery, suspense, and crime books will also enjoy it. My cousin, a photographer, was talking about doing a series of photographs starring a female detective. He wondered if I could write a story to which he could place them. Sensing the million dollar movie deal that would undoubtedly come from such a work I pushed him off the cliff we happened to be walking along and stole the entire idea for myself. Ishmael. But then I found out that Melville bloke had already written him. Louis Credo was pretty cool. I like the idea of a cocaine addicted cop. Functioning addicts are seldom portrayed. Usually we see addicts as barely hanging on wastes of life. But there is a huge amount of people out there who are great at their jobs whilst being addicted to one thing or another. Credo might show up again. That’s like asking me to pick a favorite drink out of the near endless selection of choices. It would be gin. And my favorite book is Stephen King’s It. Well, the mole on my arm might be getting bigger, but it doesn’t seem to have affected my writing ability one way or another. I just keep putting the words on the page and, for some reason, people keep reading them. I don’t practice anything specifically. It’s a very unrefined process. I sit down, write a story. Rewrite it until I can’t think of a way to make it better, and then let it go out into the world. Reading was always intuitive for me. I know if I like a story or not. And I don’t have to break it down into its individual parts to know I liked it. It’s the same with writing. I know if the story I’m writing is entertaining to me or teaching me something. I follow my gut, in other words. No, I hated English. Probably because it was either about finding verbs and nouns and learning what the hell a gerund was. That stuff is boring. I liked science. Try to make recognizing an adverb stand up against learning what happens to matter as it approaches the event horizon of a black hole and it’s no contest. Even writers don’t write about English. They write about the cool stuff that happens outside of English class. Excited. I know we all have an attachment to bound books. But digital format is not going away. Its low production cost and multiple formats make literature more accessible than it’s ever been. And for all you going on about the smell of “real” books. It’s the words that make the book what it is, not that damn odor. Some have, some haven’t. The ones who have supported me will have a secure place in my kingdom when I rule the world. The ones who didn’t support me . . . God help the poor sods. It sounds horrible since it’s exactly what I’m doing now, but promoting. It’s not that I don’t like it, but I’d much rather have Harry Potter come and wave his wand and make that part take care of itself so I could focus all my energy on writing. Computer all the way. My dad had an old typewriter that I used a few times for kicks. It wasn’t a bad way to knock out a first draft, but it was still obsolete compared to digital word processing. I tried pen and paper a few times because I liked the idea of doing it that way. But it was ill-fated. My handwriting is terrible to begin with, and trying to knock out a first draft and keep up with stream of consciousness that way leads to hand cramps and an unintelligible mess on the paper. Is there anything else you'd like potential readers to know about your book? Nightfall has been shown in studies to reduce one’s risk of cancer. Nine out of ten dentists prefer it. Some studies also show that it can reverse male pattern baldness and ED in men over fifty. It has also been shown to be 100% effective in alleviating boredom if purchased right now. Length of effectiveness may vary depending on individual reading speed.